One year after completing my undergraduate studies at Gulu University in 2013, I enrolled for a Master’s in Food Security and Community Nutrition at the same university with a scholarship from the Regional Universities Forum for Capacity Building in Agriculture (RUFORUM) through their Graduate Research Grants (GRG). The unique design of the masters’ programme that includes a component of community engagement, in line with the university’s vision of community transformation, gave me the opportunity to take on new challenges. Through a community attachment, I came to appreciate community experiences and engage with them in finding solutions to their problems. My turning point came through a visit to Gulu Regional Referral Hospital, organised by the university. This visit awakened me to the reality of the nutritional crisis in rural households. The number and state of malnourished children was astonishing and compelled me to undertake my community placement in the Nutrition Ward at the hospital. During the attachment, I helped manage malnourished children admitted to the hospital for nutritional therapy. I also counselled caregivers with regard to nutrition, family planning and provided general psycho-social support. Working at the hospital has been a life changing experience and created in me the desire to tackle the problem at source. Discussions with the caregivers unravelled a series of challenges related to child nutrition, hygiene and HIV/AIDS among others. To address the problem of child malnutrition, the hospital team together with the caregivers decided to look for a solution based on locally available foods including porridge -made from millet, maize or cassava flour- bean soup, sim-sim paste, maize meal or posho, and sweet potatoes. We thus embarked on formulating a food that caregivers could routinely give to the children at home. Using locally available foods was essential so that the routine supply of material inputs was within reach of the rural households. In the end, millet, sim-sim and soy were chosen as the base ingredients. Combining these foods was a breakthrough in improving nutrition through fortification. Rural households commonly serve these foods singly yet each of them is deficient in certain nutrients. For example, cereals are low in the amino acid lysine, making their protein content less available, while legumes are low in the amino acids methionine and cysteine, but are high in lysine. Mixing the foods together into a composite food would thus help to make up for these nutrient deficiencies. Having realised these possibilities, the challenge was to ensure this innovation is acceptable to the community. This informed my masters research which is on “Developing and evaluating acceptability of millet-sesame-soy composite as a complementary food in Acholi Sub-region of Uganda”. My engagement with over 30 households in the community has been received with excitement and already there are improvements in the nutritional status of children. This community engagement has been a new and exciting experience for me, but above all, has allowed research to give back to the community immediately. It has also transformed my perception of how to conduct research. I remain highly grateful to RUFORUM for paying my tuition and to the staff of Faculty of Agriculture and Environment of Gulu University for the academic support. 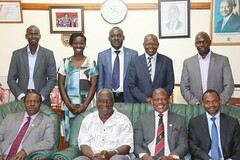 Special appreciation goes to my mentors, Dr. Duncan Ongeng and Prof. Ipolto Okello-Uma, for their diligent effort.